Posted by Shelley Grell on December 22nd, 2011. 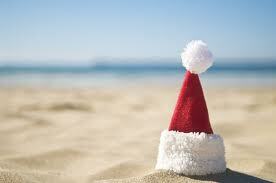 Ah the smell of pine, the opening of the advent calendar, the visits to Santa, and lazy hot summer days at the beach. Don’t you love Christmas? Especially this Christmas. The last message we broadcasted was after the February earthquake. Since then we’ve been recovering, fixing, and adapting to the situation. It’s been both mentally challenging and disruptive, but we are surviving, and I’m pleased to say that thanks to our wonderful customers and referrers things are looking up for 2012. As our Avonside office was too damaged to work from, we (like many others) are now working remotely from our home offices and making use of online tools such as Dropbox and Skype. It’s working well, and the flexibility of accessing and sharing data anytime, anywhere is proving very handy. We hope you enjoy this news update on some of our recent activities. Please note that we’ll be closed between Christmas and New Years, and both Shannon and I will be back on deck from 4 January. 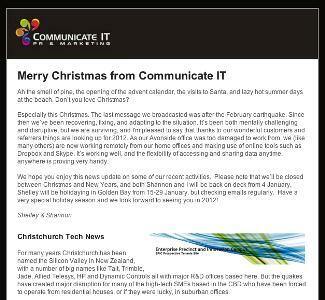 Shelley will be holidaying in Golden Bay from 15-29 January, but checking emails regularly. Have a very special holiday season and we look forward to seeing you in 2012!